I made this table and bookshelves for the Erlenhof study. The front of the bookshelves is made from a large Euro Mini's window (I used another window frame for making the fireplace). The table is decorated with a painted fabric trimming ribbon. Tein tämän pöydän ja kirjahyllyn Erlenhofin työhuoneeseen. Kirjahyllyn etuosa on tehty isosta Euro Mini's -ikkunasta (toisesta ikkunan karmista tein takan). Pöytä on koristettu maalatulla kankaisella koristenauhalla. 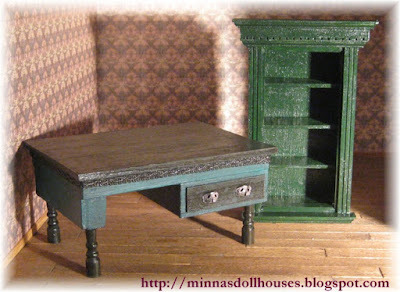 Love your choice of colours Minna:) and I especially like the table. Unos muebles muy bien trabajados, estarán muy bien en el despacho. A very Happy 2011 to you! I hope you will have a great New Year. ¡¡Feliz Año Nuevo,tambien para tí corazón!! WoW! What a great job. You do such good work. I should get back to making my Doll House. Russ, you should get back to making your dollhouse! It is sooo much fun!